Or Haneshamah holds a variety of services and events for the High Holy Days and for the Jewish month of Tishrey. You can find details below and in the calendar listing for each event. Licensed childcare is available on the High Holy Days and engaging youth programming (more information coming soon), is offered on Rosh Hashanah morning and Yom Kippur. 6:30 - 7:30 pm We usher in the New Year with a brief service of singing, inspirational messages, and the sweet taste of apples and honey. In Fellowship Hall. 9:30 am - 12:30 pm The first day of Rosh Hashanah begins with a morning service of song, prayer, torah and discussion led by Rabbi Liz along with members of the community. A highlight again this year will be members’ reflections on the three holy day themes Malhuyot/ sovereignty, Zihronot/ memory, and Shofarot/ calling, and the voices of our Instant Choir. There will be Machaneh/camp-inspired activities for school-age children, babysitting for toddlers, shofar, and our sumptuous pot-luck luncheon (sign-up below). In the Sanctuary. Childcare will be available from 9:30-12:30. Youth Programming: Youth will join the community in the Sanctuary to start the morning then join our educator from 11:00-12:15 in adjacent Fellowship Hall for fun and engaging Rosh Hashanah-related activities. 5:30 - 5:45 pm We observe Tashlich, the casting off the crumbs of our wrongdoings into the moving waters, on the west (Glebe) side of the Rideau Canal, just south of Pretoria Bridge. 9:30 am - 12:30 pm On the second day of the new year, we approach our gathering in a contemplative manner, with chanting of niggunim/wordless melodies and short phrases from the liturgy, periods of quiet meditation, and studying the messages of the season’s Torah lessons through traditional and contemporary teachings. Our text study will be led by Judith Wouk, and focus on the question: What does it mean to have a “good death?” Starting from texts of the death stories of Biblical and Talmudic figures, we will consider: Did s/he die a “good death?” What is the role of preparation for death on each of the four planes: physical (advance directives, will, list of bank accounts, passwords), intellectual (funeral plans, Chevra Kadisha, burial, cremation, new technologies, donating to medical schools), emotional (speaking with family about one’s wishes) and spiritual (teshuvah, making amends, bringing more simplicity into death planning)? In Room 5, lower-level. 6:45 - 9:15 pm Beginning with the haunting Kol Nidre on cello and piano, followed by the three repetitions offered by Rabbi Liz and members of the community, we greet the most solemn day of the year garbed in white garments and tallitot/prayer shawls, fasting (if able), attuning to the ancient intervals and preparing to lead ourselves through a day of repentance and remembrance. In the Sanctuary. (Please note that we begin Kol Nidre service promptly with the instrumental rendition.) Childcare will be available from 6:30-9:15. 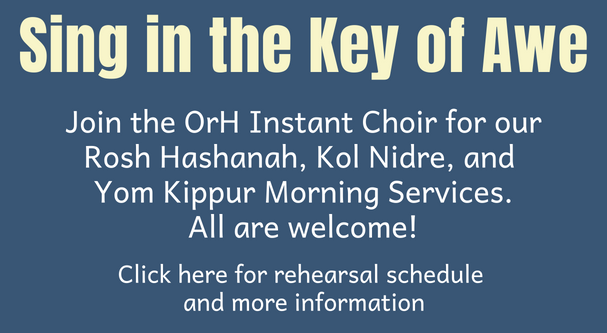 9:30 am - 1:30 pm The morning of Yom Kippur sustains our engagement with the themes of individual and communal repentance and commitments through prayer, song, chant, the reading of Torah, and the deep bowing of the Grand Aleynu. In the Sanctuary. Childcare will be available from 9:30-1:30. Youth Programming: Youth will join the community in the Sanctuary to start the morning then join our educator from 11:00-12:45 in adjacent Fellowship Hall for meaningful and engaging Yom Kippur-related activities. 5:30 - 8:00 pm We reconvene for the afternoon Minhah Service, once again featuring a father-and-son chanting of the story of Jonah along with our alternative Torah reading. We reconstruct the traditional Avodah service to consider a member’s presentation of a thoughtful reflection on a challenging issue or concept in our tradition, with the opportunity to respond. The always meaningful Yizkor service follows, which will also feature a personal reflection on loss from an OrH member, along with the honouring of the memories of our dear departed. Finally Neilah beckons us, through song and silence, before the open ark or at our seats, towards the final great blast of the shofar, and the conclusion of our full day with havdallah. In the Sanctuary. We share a communal break-fast meal immediately following in Fellowship Hall. Childcare available from 5:30-8:00. Youth Programming: Youth will join the community in the Sanctuary to the afternoon then join our educator from 6:15-7:15 in adjacent Fellowship Hall for meaningful and engaging Yom Kippur-related activities. Decorating the sukkah, singing and waving the lulav and etrog. In Room 5, lower-level. A joyous celebration of the torah, including music, dancing and the dramatic unrolling of the entire scroll. In Fellowship Hall.